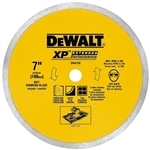 To get the best performance out of your saw or grinder, it is important to equip an appropriate blade. 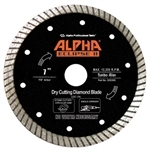 We carry a great selection of diamond blades including blades for tile, stone, masonry, and concrete. 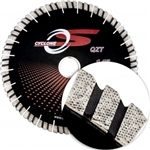 With diamond blades ranging from economical to those made for high-end production in sizes from 4 inches – 18 inches, you’ll be sure to find the blade that suits your needs. 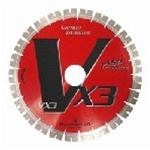 We carry blades by trusted manufacturers including Alpha, Diamant-D, Husqvarna, and Mad Max. 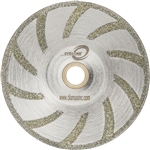 Segmented Blades – Generally, these blades have medium to hard bonds for a range of wet and dry cutting applications, and can be used to cut a variety materials including marble, granite, concrete, and masonry. 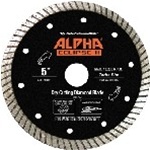 Continuous Rim Blades – With no individual segments, these blades have softer bonds for wet cutting harder materials like tile, granite, glass, and other easily chipped materials. 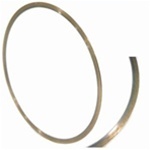 Turbo Blades - Similar in appearance to continuous rim blades but with a serrated edge, these blades have soft to medium bonds with fast cutting speeds and smooth cuts. Bond Hardness – Bond strengths may be soft, medium, or hard and determines the rate at which new diamond particles are exposed. For hard materials like granite, a blade with soft bond strength will provide the best cutting performance. For soft materials, a blade with a hard bond should be used. Diamond Grit Size – Available diamond grit sizes include coarse (#20 - #60), medium (#80 - #220), and fine (#240 - #400). Coarse grit will provide fastest cut with roughest finish while fine grit will provide the smoothest cut but as a much slower cutting speed. For precision slicing and gentile curves, backwards and forwards, in glass, stone and marble. Blades have extremely long life. 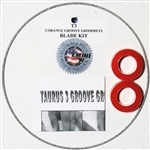 This Gemini Apollo 6" Rigid Blade is used for straight cuts and slicing. For precision slicing and gentle curves, backwards and forwards, in glass, stone and marble. 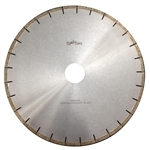 10" Diamond blade, fits the Revolution wet saw. This blade is designed for those of you who want to cut any type of glass chip free. 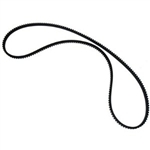 Belt For Gemini Revolution Tile Saw. For general use, Omni-directional. The Standard blade gives you strength as well as versatility in all materials. Made in Italy, the Italdiamant 5" Dekton Blade is specifically designed for use on Dekton and other ultra hard compact materials. Made in Italy, the Italdiamant Zeus Blade is one of the highest quality products you will find for cutting granite, quartz, engineered stone and other natural stone. Our Mad Max Silent Marble Blade is a premium blade and is designed for fast, high production cutting of marble with no chipping. 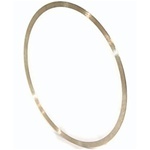 Available in 14" & 16" size. Enjoy fast, chip-free, cutting with the Mad Max Silent Blade For Crystallized Slab.